The demo for Injustice: Gods Among us is now live for the PS3 and Xbox 360! No word yet if Wii U players will get access to it. The demo contains playable versions of Batman, Wonder Woman, and Lex Luthor. Get it now to hold you over until Injustice’s April 16th release! When they hear that a game focused solely around super heroes is in the making, gamers tend to be skeptical. Developers continue to fail in meeting our expectations of superhero games and in doing so their efforts flop like a fish fresh out of water. Now, there are some great licensed games out there, such as the Batman Arkham games and Spider-Man Shattered Dimensions. However, they’re so few and far between that the term ‘superhero game’ is usually associated with something mediocre-to-terrible. Remember last year’s The Amazing Spider-Man? Thankfully, NetherRealm Studios’ latest fighting game looks to defy that stereotype. It shows that it’s very much possible to have a game featuring our favorite heroes, which is both exciting and high in quality for a modern video game. This is Injustice: Gods Among Us. I may be putting a lot of faith in the success of this game, but the plentiful trailers and the genius idea of having the characters face each other in a tournament is doing wonders to build up hype leading up to the April 16th release. NetherRealm has had a lot of experience with fighting games with its successful Mortal Kombat franchise from before Midway Games filed for bankruptcy, and it isn’t their first time using DC characters either. They released the title Mortal Kombat vs. DC Universe a few years ago, albeit to mixed results. Fans were psyched about pitting Mortal Kombat characters against popular superheroes such as Superman, but in the end were disappointed by the lack of violence that the Mortal Kombat brand is known for. NetherRealm learned from their fans and are making a second attempt; one that will hopefully satisfy both comic fans and Mortal Kombat vets alike. DC still prohibits NetherRealm from using that Mortal Kombat brand of graphic violence when it comes to their characters–no decapitations, no fatalities, and no unique ways of splitting someone in two. You might think that puts a damper on NetherRealm’s signature violence, but they’ve come up with a new style of action that will not only keep everything just as intense, but fits the concept of super heroes fighting each other like a glove. For what it lacks in over-the-top violence, Injustice reciprocates with crazy jaw-dropping action. When first seeing a fight in progress, you can definitely tell this is a NetherRealm game. The characters and environments are realistic and dark, every punch is felt as it connects, and the familiar HUD is in the corner, containing a bar that fills up with each attack landed and taken. 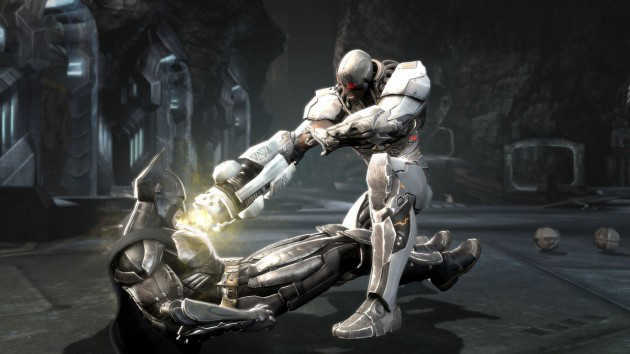 However, underneath the familiar exterior are several new mechanics that make Injustice stand on its own from other games in the fighting genre. All the characters–heroes and villains–are split into two different classes: Power characters and Gadget characters. Power characters are the over-powered fighters who can throw cars like cardboard boxes, while Gadget characters rely on their speed, agility, and as their name states, gadgets, to take down opponents. The one question that everyone has been asking is how can someone like Batman stand a chance against, say, Superman in a fight? There’s definitely a reason for the balance among the characters, but NetherRealm hasn’t revealed what it is, as it’s likely an important plot point. Just know that there’s a reason for everything. Check out the video below for the official Injustice story trailer. From what we can tell so far, the story revolves around the ‘human’ characters standing up against the superheroes. The why of it all is beyond me, but the circumstance is uniting heroes and villains to form a resistance. Hopefully the story is stronger than NetherRealm’s previous games, as that’s been a constant downside to their games for years. Let’s get down to the gameplay. From what you can tell from the videos, the game seems to focus on being equally entertaining and jaw-droppingly epic. This is evidenced by the way you can utilize the environment to your advantage. Power characters can smash cars over their opponent’s head, while gadget characters can use cars to hop behind their adversaries. Lasers, rockets, robots, portals; just about anything can be used to turn the tide of a fight. Stages are much more than a couple of tricks though. Characters can be smacked straight through a wall, floor or ceiling if hit hard enough. This commences a cringe-worthy (and sometimes hilarious) sequence showing the character hitting objects and hazards before landing in a whole new area of the stage. If you watched the videos above, you may have noticed the insane moves that the characters pulled off. When you fill up your battle meter all way, you can perform what’s called a ‘super move’, which naturally deals a copious amount of damage. I’m not going to announce any of them, because they’re such a blast to watch for the first time, but that’s just one of the things you can spend your battle meter on. If you have at least one segment filled, you can use the classic combo breaker to get out of a nasty situation. Or, you can initiate an epic clash between the characters, which has the players bet a certain amount of their bar. Whoever bets the most wins the clash and gets significant damage dealt to their opponent. Netherealm has a knack for having lots of characters, and a healthy amount of bonus content outside of the story and multiplayer. Injustice is no exception! So far twenty-two characters have been announced, with potentially more on the way. Also count on there being tons of collectibles and minigames to play on the side from the main story. Injustice: Gods Among Us comes out April 16th and it’s building up a lot of hype. What do you think? Does it look like a smash hit, or a dud? We at inMotion Gaming love to hear from our readers, so leave a comment below and give us your opinion!